Meet the Louis Vuitton Damier Azur Lymington bag. 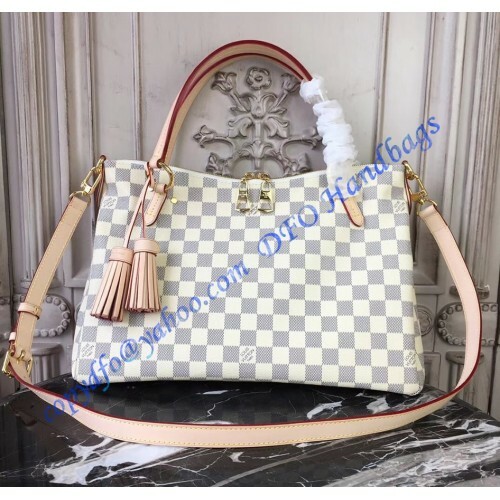 It is another combination of old and new made by Louis Vuitton and it is currently known as one of the most popular bags on the market. There are a lot of reasons for that and the biggest one is already mentioned. Yes, the bag comes as a mixture of all, good and traditional advantages, but at the same time, it is adapted for modern use. 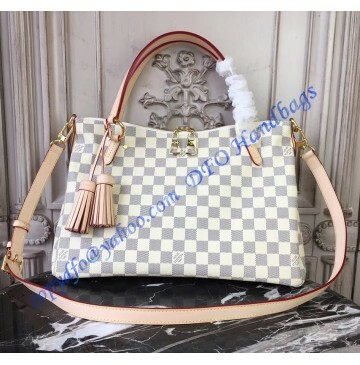 The bag is made of Damier Azur monogram canvas, which stands out from the crowd as soon as you see it. Touching it will probably make you a happy woman as well. But, traditional bags are not very useful today. They usually offer limited space or pockets too big for modern accessories. 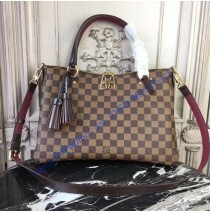 The Louis Vuitton Damier Azur Lymington bag has all of that changed and adapted. Let’s start with the handles. At the top, you can see two flat handles which are extremely practical and easy to use. There is an additional shoulder strap which can be fully adjusted or removed. All three parts are made of leather. Add the two removable tassels, a massive interior pocket and a double pocket for smartphones and you can get a clear picture on how practical the bag truly is. At the bottom, you can see 4 studs which will protect the items at all times and which make a difference. In essence, you get all the space you are going to need and you will have a great time with your new bag, regardless of the fact where you are at the moment. The look is something else. This bag is just perfect for any occasion you may have on your mind and it will help you make a positive impression regardless of the fact are you located in a vacation or you are at work. You will like the fact that the Louis Vuitton Damier Azur Lymington bag is also adapted to be used on a beach. It is a member of 2018 spring/summer collection, so this is a mandatory addition you will need and get. The last but not least, all of your belongings will be secured by the famous Louis Vuitton zipper. It is adapted for heavy-duty usages and it can withstand almost anything. All of this, besides the style, luxury and quality will be yours if you get this bag.